Payroll can be a nightmare for most small business owners. Their businesses may be small, but they do have employees who have to be paid. Most small businesses don’t have the budget to hire a specialist for dealing with the payroll issue and cutting paychecks of employees. It is a very time consuming task and there is plenty of room for errors. The good news is that now they can use time card calculator for dealing with their payroll needs and avoiding any possibility of errors. This is a simple software that doesn’t require business owners to have a lot of technical knowledge to use it effectively. Calculating employee pay becomes an easy and time saving process with this software. This is due to the fact that it makes it easy for you to keep track of the number of hours that each employee or contractor put in. Moreover, it is also quite simple for you to deduct time for which no compensation has to be paid to the employees such as lunch breaks. Most importantly, this software is immensely helpful in calculating the overtime pay that should be given to each employee. 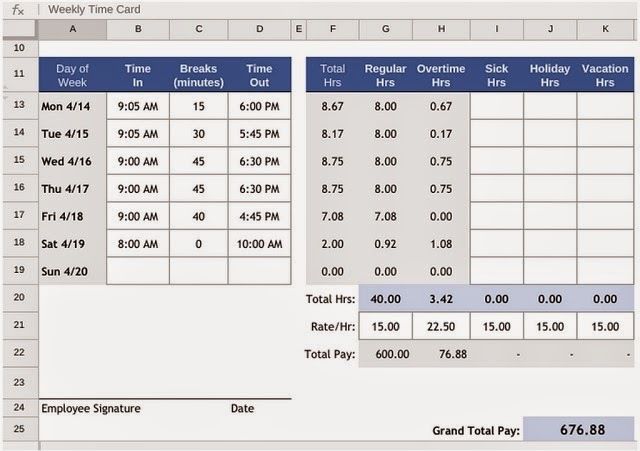 Hence, a time card calculator is basically a simple version of the more advanced payroll software that aren’t very easy to operate. The calculator has separate columns where you can list the break time taken by employee. Likewise, separate space is provided to you for keeping track of an employee’s holiday hours, vacations and sick leave. The overtime pay is calculated in accordance with the federal and state laws to ensure there is full compliance. Using this time card calculator will save you considerable time that you can devote elsewhere. In addition, manual recording of an employee’s working hours and overtime hours can lead to mistakes and arguments. Using this software can prevent any such problems. You can tally the number of hours and pay with the employee’s own calculations to ensure they are accurate. As the software is easy to use, there is no need to hire an expert so it can turn out to be a highly cost effective solution for your small business.